What will my alterations cost? If you choose to have our alterations department alter your dress, you will be charged for all work done to your dress. This includes bridal gowns, bridesmaids, mother's dresses, prom gowns, formals and flower girl dresses. Price quotes will be given for each project, and will vary, depending on the time and skill needed. During your first fitting, we will be happy to give you a rundown of the costs after we know what alterations you need. What if I didn't purchase my dress from The Bride's Shoppe? We are usually not able to provide alterations services on dresses purchased elsewhere, although sometimes during slower weeks we will take on additional sewing. During peak prom and bridal seasons, we are absolutely unable to take in extra sewing. All appointments must be approved by our seamstresses. Please call or email and we will check our schedule for openings. NOTE: The Bride's Shoppe is unable to do alterations on any gowns purchased on the internet. Our priority is to give our customers a beautifully fitted gown. In order to give you the best service it is very important that you bring the actual bra, undergarments, shoes and slip that you will be wearing on your special day. Even "flat shoes" can differ from zero to 2 inches, depending on the sole! If you have your hem marked with shoes other than the ones you will actually be wearing and there is a discrepancy in your hem, you will be charged to re-do the hem. So don't forget your shoes, ladies! Usually, brides have two or three fittings and then pick up their dress on a scheduled date. Other dresses may only require one or two fittings before pick-up. If your weight fluctuates, more fittings may be required. Many times, if you are having a hem marked, it will be basted but not cut off at your second fitting. You will have to schedule a later pick-up date. Please make sure you understand if you are coming in for a fitting or to pick up your dress! Unless you have made arrangements to do so, you will not try on your dress on the day you pick it up, as we will have it freshly pressed and on a dress form. 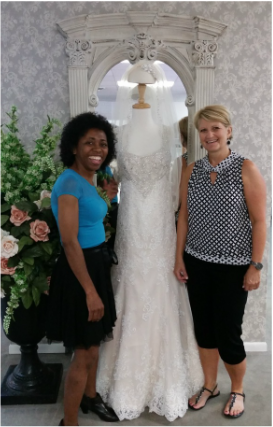 Our seamstresses will be happy to help you with your fitting schedule! We get it, life happens! However, we are a small boutique who takes a limited amount of appointments each day, so please take your fitting time seriously and cancel your appointment within 48 hours if a conflict comes up. Who are The Bride's Shoppe seamstresses? Raymonde, who is from Madagascar, and Paula, from Great Falls. Both ladies are highly skilled, love the work they do, and are pleased to give you a beautifully fitted gown.